What is Biofield Tuning and how does it help? Biofield tuning is like a tune-up for out-of-tune human beings (I was going to say bodies, but we are so much more than just our bodies, and biofield healing recognises this). Biofield Tuning is an alternative therapy based on the use of tuning forks. 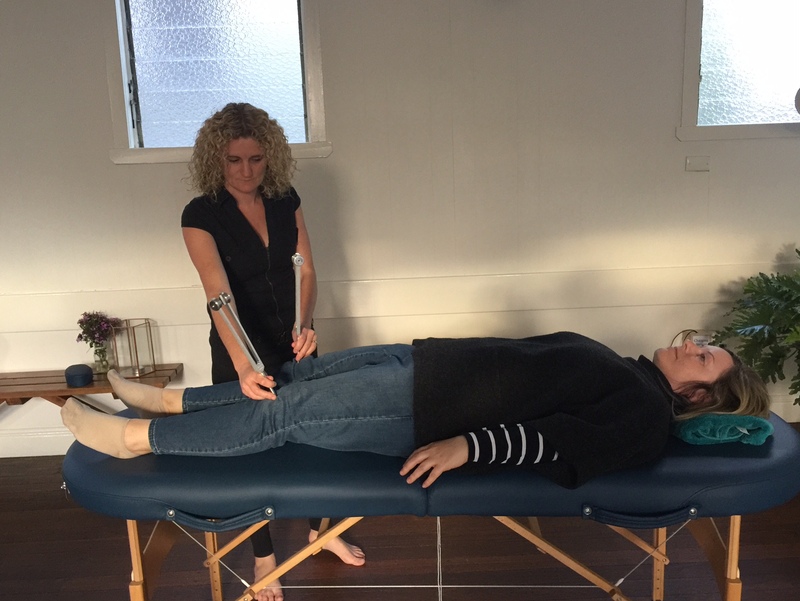 The soundwaves from the tuning forks affect the biomagnetic field – or biofield – that surrounds the human body, causing deep relaxation and helping the body to re-calibrate itself to “factory settings”. How do Biofield Tuning Forks work and how can it help? The client lies comfortably on the treatment table, while the practitioner stands approximately 5 to 6 feet away – at the edge of the biofield. Two regular tuning forks are sounded regularly, as the practitioner gradually moves closer to the treatment table. Just like the rings in a tree trunk, different distances correspond with the various ages. The starting point of 5 to 6 feet for example, relates to the time of our birth. Things like trauma, accidents, and overwhelming emotions such as anxiety, grief and stress – all the stuff we normally push aside – can get trapped in our biofield. The frequency and sound of the tuning forks identifies these blockages, and you can actually hear the sound and vibrations change. Once alerted to resistance, the practitioner spends more time in this area, to restore the flow of energy. I like the sound of it, but I don’t live near you! Treatment can be done in person or by distance, with individuals or groups – please ask if you’d like to find out more.